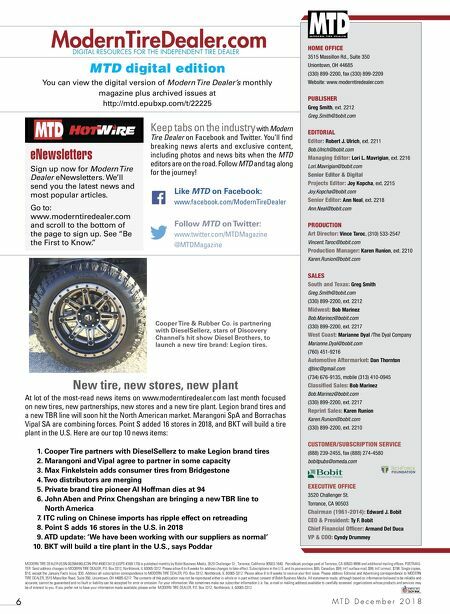 M T D D e c e m b e r 2 0 1 8 6 MODERN TIRE DEALER (ISSN 00268496) (CDN IPM #40013413) (USPS #369-170) is published monthly by Bobit Business Media, 3520 Challenger St., Torrance, California 90503-1640. Periodicals postage paid at Torrance, CA 90503-9998 and additional mailing offices. POSTMAS- TER: Send address changes to MODERN TIRE DEALER, P.O. Box 3312, Northbrook, IL 60065-3312. Please allow 6 to 8 weeks for address changes to take effect. Subscriptions in the U.S. and its possessions, $65; Canadian, $99; Int'l surface mail, $99; Int'l airmail, $198. Single copies, $10, except the January Facts Issue, $30. 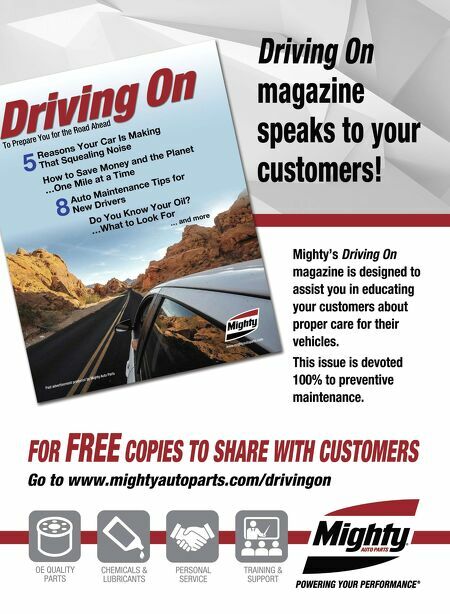 Address all subscription correspondence to MODERN TIRE DEALER, P.O. Box 3312, Northbrook, IL 60065-3312. Please allow 6 to 8 weeks to receive your first issue. Please address Editorial and Advertising correspondence to MODERN TIRE DEALER, 3515 Massillon Road, Suite 350, Uniontown, OH 44685-6217. The contents of this publication may not be reproduced either in whole or in part without consent of Bobit Business Media. All statements made, although based on information believed to be reliable and accurate, cannot be guaranteed and no fault or liability can be accepted for error or omission. For your information: We sometimes make our subscriber information (i.e. fax, e-mail or mailing address) available to carefully screened organizations whose products and services may be of interest to you. If you prefer not to have your information made available, please write MODERN TIRE DEALER, P.O. Box 3312, Northbrook, IL 60065-3312. ModernTireDealer.com DIGITAL RESOURCES FOR THE INDEPENDENT TIRE DEALER Keep tabs on the industry with Modern Tire Dealer on Facebook and Twitter. You'll find breaking news alerts and exclusive content, including photos and news bits when the MTD editors are on the road. Follow MTD and tag along for the journey! Like MTD on Facebook: www.facebook.com/ModernTireDealer Follow MTD on Twitter: www.twitter.com/MTDMagazine @MTDMagazine MTD digital edition You can view the digital version of Modern Tire Dealer's monthly magazine plus archived issues at http://mtd.epubxp.com/t/22225 eNewsletters Sign up now for Modern Tire Dealer eNewsletters. We'll send you the latest news and most popular articles. Go to: www.moderntiredealer.com and scroll to the bottom of the page to sign up. See "Be the First to Know." HOME OFFICE 3515 Massillon Rd., Suite 350 Uniontown, OH 44685 (330) 899-2200, fax (330) 899-2209 Website: www.moderntiredealer.com PUBLISHER Greg Smith, ext. 2212 Greg.Smith@bobit.com EDITORIAL Editor: Robert J. Ulrich, ext. 2211 Bob.Ulrich@bobit.com Managing Editor: Lori L. Mavrigian, ext. 2216 Lori.Mavrigian@bobit.com Senior Editor & Digital Projects Editor: Joy Kopcha, ext. 2215 Joy.Kopcha@bobit.com Senior Editor: Ann Neal, ext. 2218 Ann.Neal@bobit.com PRODUCTION Art Director: Vince Taroc, (310) 533-2547 Vincent.Taroc@bobit.com Production Manager: Karen Runion, ext. 2210 Karen.Runion@bobit.com SALES South and Texas: Greg Smith Greg.Smith@bobit.com (330) 899-2200, ext. 2212 Midwest: Bob Marinez Bob.Marinez@bobit.com (330) 899-2200, ext. 2217 West Coast: Marianne Dyal /The Dyal Company Marianne.Dyal@bobit.com (760) 451-9216 Automotive Aftermarket: Dan Thornton djtinc@gmail.com (734) 676-9135, mobile (313) 410-0945 Classified Sales: Bob Marinez Bob.Marinez@bobit.com (330) 899-2200, ext. 2217 Reprint Sales: Karen Runion Karen.Runion@bobit.com (330) 899-2200, ext. 2210 CUSTOMER/SUBSCRIPTION SERVICE (888) 239-2455, fax (888) 274-4580 bobitpubs@omeda.com EXECUTIVE OFFICE 3520 Challenger St. Torrance, CA 90503 Chairman (1961-2014): Edward J. Bobit CEO & President: Ty F. Bobit Chief Financial Officer: Armand Del Duca VP & COO: Cyndy Drummey New tire, new stores, new plant At lot of the most-read news items on www.moderntiredealer.com last month focused on new tires, new partnerships, new stores and a new tire plant. Legion brand tires and a new TBR line will soon hit the North American market. Marangoni SpA and Borrachas Vipal SA are combining forces. Point S added 16 stores in 2018, and BKT will build a tire plant in the U.S. Here are our top 10 news items: 1. Cooper Tire partners with DieselSellerz to make Legion brand tires 2. Marangoni and Vipal agree to partner in some capacity 3. Max Finkelstein adds consumer tires from Bridgestone 4. Two distributors are merging 5. Private brand tire pioneer Al Hoffman dies at 94 6. John Aben and Prinx Chengshan are bringing a new TBR line to North America 7. ITC ruling on Chinese imports has ripple effect on retreading 8. Point S adds 16 stores in the U.S. in 2018 9. ATD update: 'We have been working with our suppliers as normal' 10. BKT will build a tire plant in the U.S., says Poddar Cooper Tire & Rubber Co. is partnering with DieselSellerz, stars of Discovery Channel's hit show Diesel Brothers, to launch a new tire brand: Legion tires.